Kid's bedroom should be located to the east and southeast corners of the house because it will trigger for the movement and development of your child. If your child already under active positive, you should choose the Southeast to create the harmony of yin and yang. If your child is shy, gentle, sedentary than negative attributes, you should choose East to activate your kids, make them more confident and more active. You should design a monochrome for your child's bedroom and a gentle warm style, not to create a tranquil, too, so will cause hard feelings, making the child sleep without sleeping, dreaming sleep. So your child's bedroom should be painted with warm colors just right, along with materials with soft lines, neutral and decorations appropriate to the age of your child. Your child's bedroom should be located close to your bedroom. So you can easily control their activities and timely help them if necessary. While designing the bedroom of your child, you just spent an area of more than 3 to 5 times the area of bed is enough, so your child will not feel empty, lonely and not feel worried, scared. As well as your bedroom so, your child's bedroom should not put too many electronic devices such as computers, televisions, loudspeakers, sound amplifier... they can generate waves lead to the child's mental disturbance during sleep. Your kid's bedroom should be neatly organized, to create good habits for your kid. As you know, kids have a very bright soul. All of nature through the eyes of them are very strange. All around them are certain to affect on the child's soul. Therefore, building a colorful environment, lively for children is also considered important to their world view. 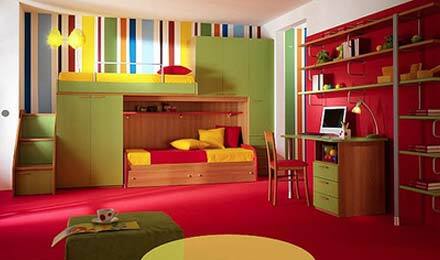 Therefore, the principles of feng shui design would be useful to apply to the design of children's bedrooms. It will help your child have an interesting life, happiness and create an orientation to develop a good character to your child later. Wish you have best choices for your dear kids!